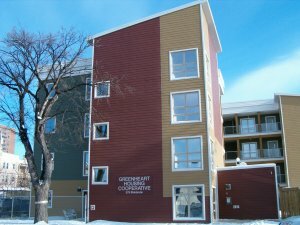 The twenty one – three bedroom garden apartments targeted for low and modest income tenants, was built by Kikinaw Housing Inc. in West Broadway. The units opened in Fall 2009. They are energy efficient, with green design choices, universal access and a community cornerstone location. The Jubilee Fund provided a line of credit for the $2.4 million dollar investment.